A note from Joe: Today's post is from Debbie, who you may remember as the swimmer from the half ironman relay a few years ago. I pestered her into trying out Cyclocross and this is her account of what happened. “You know you want to try it,” the email read. I let my cursor hover over the ‘reply’ button while I considered how to respond. 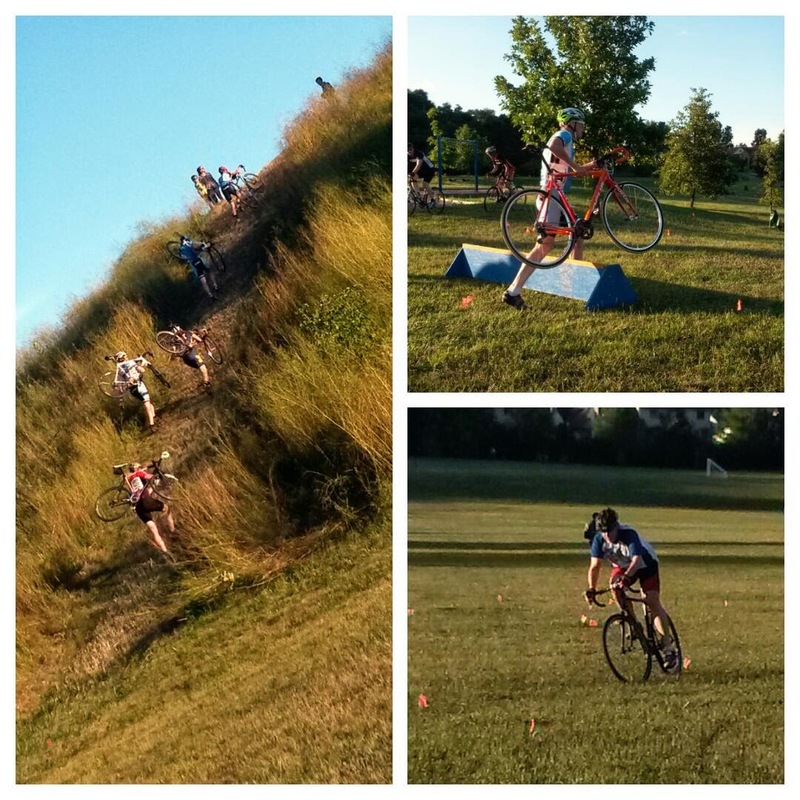 My co-worker had been bugging me to check out this weird sport called cyclocross for over a year now. I love my road bike and I love my mountain bike even more. Even so, I couldn't wrap my head around the idea of jumping off a perfectly good bike so I could drag it over obstacles. But, I'm always up for learning something new. 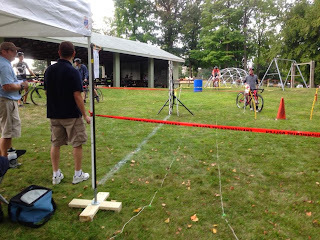 The CXpreX folks are putting on a series of four clinics in Ann Arbor which involve about 45 minutes of instruction followed by a super-casual race. When I showed up for the first clinic, I had no idea what to expect. I unloaded my bike and realized two things – I was the only woman there and I was the only person with a mountain bike. As more riders trickled in, I was glad to see a few other women and at least one other person with a heavy mountain bike in tow. The clinic began with the instructors introducing themselves and explaining their history with cyclocross. Each instructor collected about 5 people and started working on skills. My group started off learning the best technique for jumping over obstacles. Our instructor, Adrienne O’Day explained the proper technique for unclipping from your pedals as you approach the obstacle, dismounting your your bike, hoisting your bike over the obstacle and smoothly re-mounting after the obstacle. Pretty basic stuff, but tougher than it looks (especially when your bike weighs ~30 pounds). They had two types of obstacle on which to practice. The typical ones were made of wood and looked like they would hurt if you crashed into them. 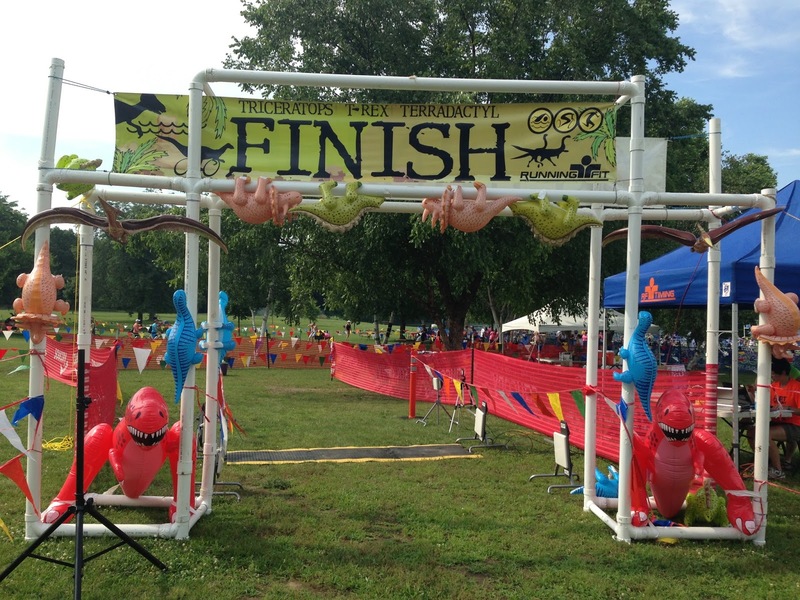 They also had obstacles made from PVC tubing that looked a little less intimidating. I decided to start with the plastic one. Jumping over the obstacle took me back to my days of running hurdles on the high school track team. I did a few jumps over the plastic barrier then tried the wooden one. I was feeling pretty confident about the whole thing until the guy in front of me couldn’t unclip in time and crashed hard. It looked pretty painful, so I went back to jumping over the plastic barrier. After we practiced the obstacles, we talked about race techniques. Adrienne recommended doing a trial run of the course before every race. And with that, we all did a trial run of the course that had been set up for us at Leslie Park. I was happy to see that the path that was outlined was wide enough for two or three riders to run abreast. In other words, there was plenty of room for others to pass me. The course included a lot of winding curves, hairpin turns and one killer hill. As I looked at the hill with trepidation, Joe told me that one race he’d participated in had involved a hill that was rideable. I decided to make use of my mountain biking skills and ride the hill instead of running up it. As I started up the incredibly steep grade, I quickly realized that my approach was laughable. Soon I was pushing my bike up a 40%* incline, sucking wind and cursing my MTB shoes that were not meant for climbing on slippery grass and dirt. All in all, the clinic was a blast. I enjoy meeting like-minded people and I got a good workout. I don’t think I’ll be taking up cyclocross racing since none of my bikes are suitable for it and I can’t see adding yet another bike to my fleet. If you tend to gauge your workouts by how much pain you’re in the next day, then cyclocross is a great workout and I would recommend giving it a try. "This is the preschool art version of the concept I have for the jersey. In general I'm going for something that's not a large departure from previous designs. Still bold and crisp designs without a lot of clutter. 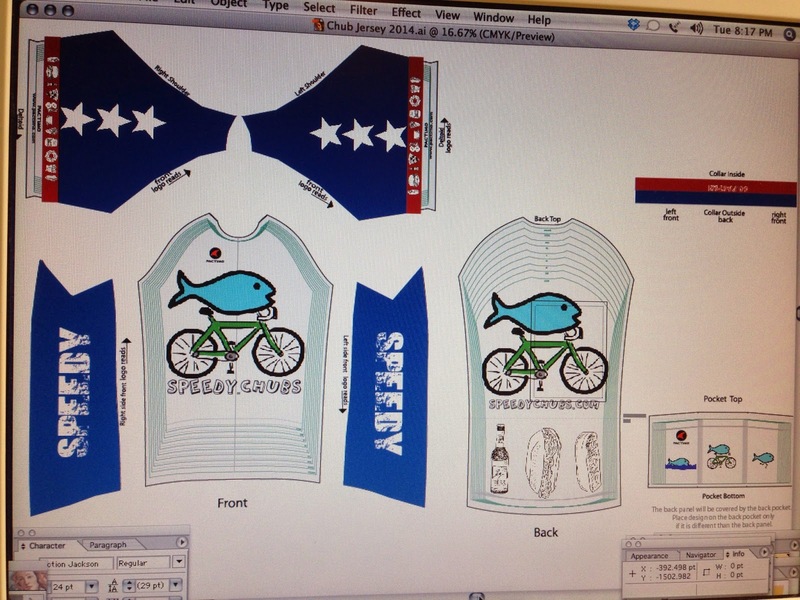 But now, since this is a full custom jersey, the whole thing can be printed. So, I also want to add some hidden details that you can only see when you're up close and personal. The front and back remain mostly unchanged. The tri-chubs on the back move down to the pockets like I originally wanted them to be. Inside the pockets (only visible if you are opening the pocket and looking in) are pictures of Twinkies, a sandwich, and a beer bottle. Think of these as pocket content suggestions. 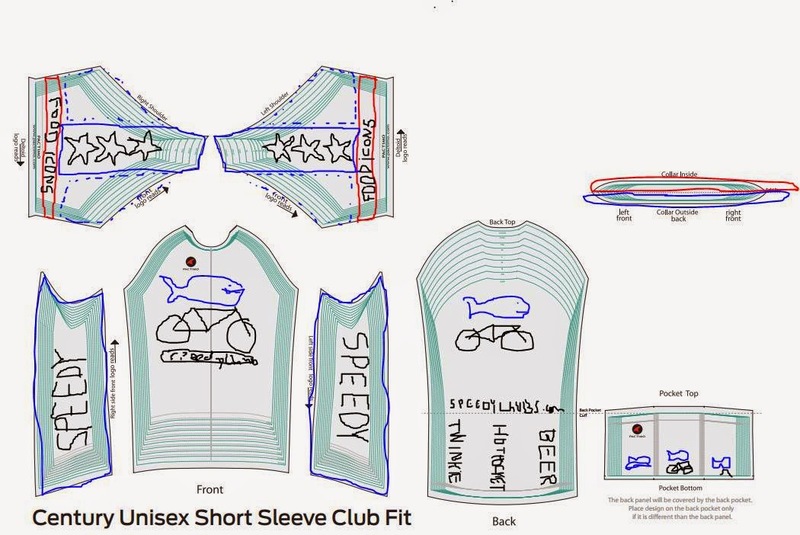 The side panels will be the same bold blue from previous jerseys, except a bold "SPEEDY" will be on them. The sleeves have the most changes to them. The cuffs will have a white stripe, then a red stripe above that. In white will be the icon sized cartoon outlines of our favorite foods. A detail only perceived up close. Then above that either a blue field or a wide vertical blue stripe (I'm leaning toward the blue field). Three big, bold, white stars run up the shoulder. These are equal parts 'Murica, Star bellied sneetches, and Captain America inspired. The collar will be blue on the outside (like previous years) but red on the inside. On the inside a bold phrase will be printed, like "GO FASTER"." We're all excited to see how this one turns out. In my books Chicago is a great place; it has everything I'd want in a big city if I were to move to one. This year I had a goal of doing a half marathon in under two hours. So, when I saw that there would be a Rock and Roll half marathon in the middle of summer in downtown Chicago with a course that doesn't just do a ton of laps of the same little loop, I was sold. The beginning of the race seemed pretty well organized. I liked that they had waves staggered by your estimated finish time. I've been in races before where you can't even get up to a full run for a few miles because of all the people going slow or even walking in front of you. Since I was going for time instead of just to complete, this was appreciated. The course covered a large part of downtown, which included a few sections of tunnels, or at least roads under roads. Very soon I realized that I wasn't going to be able to depend on my Garmin to make sure I was pacing fast enough (or not too fast). GPS kept coming and going, but at least every mile was marked. So, I had to do math between miles (dangerous, I know) to figure out my pacing. For the first few miles I spent most of my time thinking about my pacing and I didn't even realize until we got almost half way done that I hadn't seen or heard any bands. If I had come to this race looking for an experience with a lot of Rock and Roll I would have been really upset. There was no music for the first half of the run (even though it looks like they had planned for there to be) and I think there was only one rock band, maybe two. There was a blues band, which was representing Chicago blues quite well. Then the rest were cover bands or just DJs playing some pop/dance music. My favorite, though, was when we went through a narrow road with the building creating a nearly cavernous feel and there was a DJ playing some old school Chicago house techno. Old fashioned pacing with feedback only once a mile was pretty foreign to me. Somewhere around 10 miles I could feel myself slowing down, but I only could know for sure once per mile. When I got to the last mile I knew it was going to be close. My body was telling me that this would be a great time to pull off at that burger joint over there and relax while my mind was screaming at it to shut up and just go faster for the last few minutes! I could see the finish line far away and I had five minutes left until I'd hit two hours. Had to go faster. Two minutes left and the finish line was still pretty far away. I didn't come all the way out here and go this far just to miss this goal by a few %*$#! seconds! One minute left. I channeled my inner Jens Voigt - "SHUT UP LEGS!!" I was at full sprint, lungs burning, feet screaming. I crossed the line and clicked the "stop" button on my Garmin. 1:59:22. In a daze I walked through the finisher chute and picked up some free goodies (drinks, bananas, etc.) and made my way back to the hotel room. Later that night the official results were posted. My Garmin time was pretty close to the chip time (off by only one second). In this race I learned the zen-like lesson that sometimes going slower is actually going faster. Let me explain. You see, this race had a lot of hairpin turns. And a lot of off canter sections. There was one especially fun hairpin turn that you entered while going down hill, off canter, then when you are executing the turn you're going up hill. Off canter. Before the race I did a few practice laps and really studied this troublesome turn. I could complete it without falling over, but I wasn't sure if during the race I'd be able to choose my own line with all the traffic. Then what would happen? An old coach saw me struggling with this thought while watching others attempt the turn. He suggested dismounting and running it. "You might stick it well the first lap, but think about all the rest of the laps. You'll be tired and mistakes happen", he said. I nodded in agreement, still not sure if I wanted this turn to 'beat me'. I think he could see my uncertainty. "There's no shame in running sections of a course, you gotta know when's best for you to get off the bike. You could stick it every lap, but what price do you pay in energy and time?" I tried to look more agreeable. While pre-riding some more of the course I thought about what the old coach had said. During the first lap of the race I had already decided to just try running the turn. As I approached the turn I was happy with my decision. Right at the tightest part of the turn was a big pile up of racers and going real wide around them was the rest of the group trying not to run into them, but also taking the worst line for the turn. I rolled up, dismounted while running and went between the lot. I went much faster than the people in the pile up in the center, but I went just as fast, if not slightly faster, than the people taking the much wider turn while pedaling. I should also note that because of the configuration of the turn on that hill the wider turn was also much more strenuous. My running was hardly any effort. And that's how I learned that to go faster sometimes you have to go slower. Last year I did this same CXpreX clinic series. I liked it and Cyclocross so much that I gave it another go this year. The series went from late August to early September and was held at Buhr park and Leslie park in Ann Arbor. For the first half the group of riders is broken up into small groups with an experienced Cyclocross rider who leads a skills clinic tailored to the experience level of that small group. As someone who is still pretty new to Cyclocross, I find these clinics to be quite useful. Since I wasn't starting from absolutely brand new I was curious about what we might do as part of the clinic. We did cover some of the basics, but we also went into some more advanced drills. After these clinics I now have a full portfolio of 'cross specific drills I can do on my own to work on advancing my skills. Last year during the mock races I was only barely able to even complete the race. This year I was doing much better. I got lapped by the A group (the elite/advanced riders) much later than last year. The tale of two sprint triathlons. Or, how much the bike leg impacts the overall race. 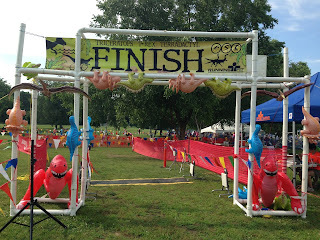 I did two of the three Running Fit dinosaur sprint triathlons this summer. I'm still relatively new to triathlons. I came to them by way of cycling and running. I'm used to pacing for both as individual events, but things change when you do swimming, biking, and running all in one event. During the first race in July it was amazingly hot out. I felt pretty good about my swimming. I've been working on it all summer and getting much better. This was the first time I had the 'problem' of being fast enough to keep up with the main pack and jostling for position. I think I actually lost time in the first 1/4 of the swim because of that. Then on the bike I had a tough time settling into a good pace. I had the Steelhead 1/2 Ironman pace all figured out, but a sprint triathlon is much different. I eventually settled into a 180 to 190 pace. Then on the run my body didn't want to go fast, no matter what I asked it to do or how nicely I asked. For the next race the weather was so chilly that getting into the water was actually challenging. For some reason I decided not to bring my wetsuit, but it would have been legal. This time I decided to take it pretty easy for the swim and bike portion, then go however fast my body felt for the run. Still managed to come in around 1:33, only 3 minutes more than the first race, but I felt a LOT better after completing this race than the first one. The run felt fun and not like a struggle. In the first race I think I went too hard on the bike, but in the second race I think I went a little too easy. I feel like I'm still learning about that balance between how much effort you put on the bike leg. Ideally you put in just enough so you can do a real fast run but not end the race with any energy left. 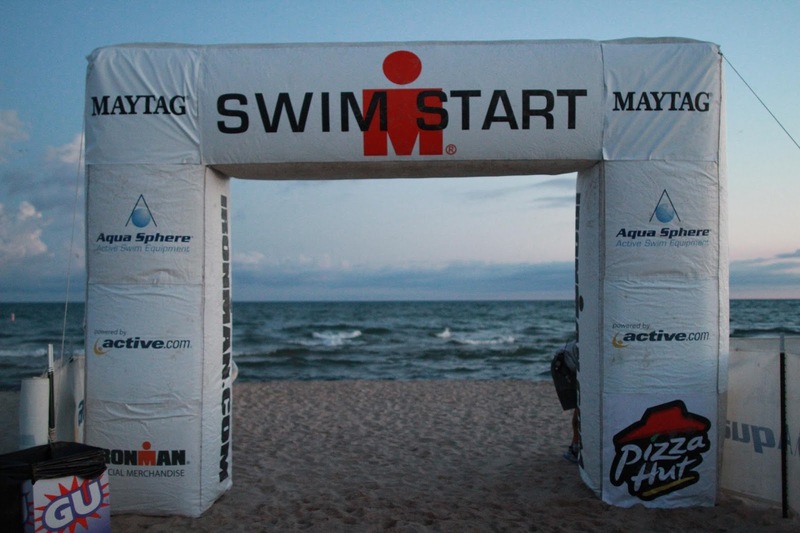 The Steelhead 70.3 Half Ironman is a long distance triathlon in Benton Harbor. It starts with a 1.2 mile swim in Lake Michigan, then a 56 mile bike ride, and ends with a 13.1 mile (half marathon) run. Two years ago I injured my back while training for this event. Getting ready for it again and doing it was a pretty big physical and psychological milestone for me. Last year a team of Speedy Chubs did this event as a relay team and this year I did it solo. Three years ago I started training for triathlons and I've done several open water swims since my first. Growing up, my family would stay on Lake Michigan almost every summer. The Lake is no stranger to me and I'm quite familiar with how powerful it can be. The thing is, I had never done any open water swimming in Lake Michigan. I knew, cognitively that this would be a different experience. The morning of the race the water was rough but certainly not as rough as Lake Michigan can be. I was in one of the last starting waves and got the pleasure of watching several people climb ashore or get fished out by the coast guard. It was like being in a speech writing class waiting for your turn to give a speech while the professor tears apart each of the previous presenters. I wasn't nervous before then, but during that 45 minutes I started to wonder. Finally our wave got lined up and off we went. We walked into the water as Lake Michigan sent three to five foot waves at us trying to spit us out. We had about 150 yards to travel away from the shore before we swam our 1.2 miles in a straight line parallel to the shore, toward the transition area. There were 16 nicely marked and spaced buoys along the way (they even changed color at the half-way point). Before I got to the first buoy I was feeling unnerved by the (what seemed to me) large rolling waves. I felt like a bobber being tossed about and making no forward momentum. I was too busy dodging people and catching my breath between waves to actually swim anything other than a doggie paddle. I wondered how I was ever going to complete a whole 1.2 miles. I also started worrying that I wouldn't finish before the time cutoff (something like 1hr 15 min. after the last wave). After I got the full 150 yards away from the shore and turned to start the swim the waves turned from crashing walls of water into huge rolling hills. I began to try actual swimming. My coaches had warned me that the rolling surf can be unnerving if you try to sight while in the valley instead of on the peak. During my first breath to the side all I saw was water - there was no shore, no other swimmers, no boats or kayaks, or buoys. The coaches were right. In the chaos of the waves and people I came to appreciate several of the lessons my swim coach had taught me. One was to swim with high elbows. This kept my arms from smacking into waves or other racer's body parts. By the second buoy I started to get the feel for the waves and just kept swimming. I had practiced sighting gracefully, mid-stroke, while swimming and even executed it well during previous open water swims in small lakes this year. But this was different. There was nothing pretty about this swimming - I had to actually stop and tread water periodically in order to get my bearings, find the line of buoys and correct my course. I got into a nice rhythm finally, and simply chugged along. About this time is when the little song Dori sang, from Finding Nemo, got stuck in my head: "Just keep swimming, just keep swimming...". I was pleasantly surprised that my arms weren't getting tired and that I wasn't running out of breath. A common race problem I had in the past was getting excited and expending far more energy than I should during the swim, resulting in little more than a bunch of extra splashing and very little extra speed. Going into this event I knew that one of the tougher strategic parts would be all about how I pace myself on the bike leg of the race. I know that I can crank out 56 miles pretty quickly, but because this is just one part of a seven hour day it doesn't make sense to blaze through the bike ride only to burn out and have to walk the run. However, you also don't want to hold back so much that you end the run and think, 'hey, I have some left in tank'. It's a challenging balancing act that I've just started to learn. Last year I screamed through the bike course tearing up the pavement averaging something like 21 mph during the first half. I remember the last half of the bike race as being challenging. Especially a couple hills in the last 10 miles. 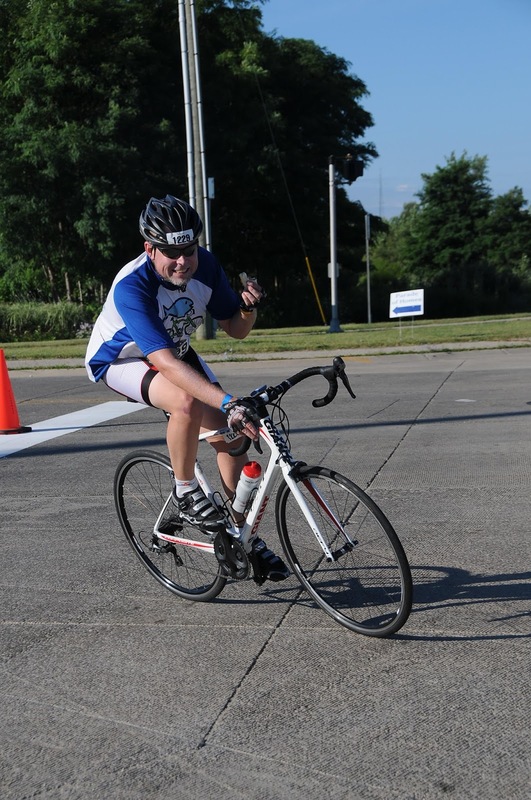 This year I moderated my effort, keeping my wattage pretty even, resulting in an average speed around 16.5 mph. 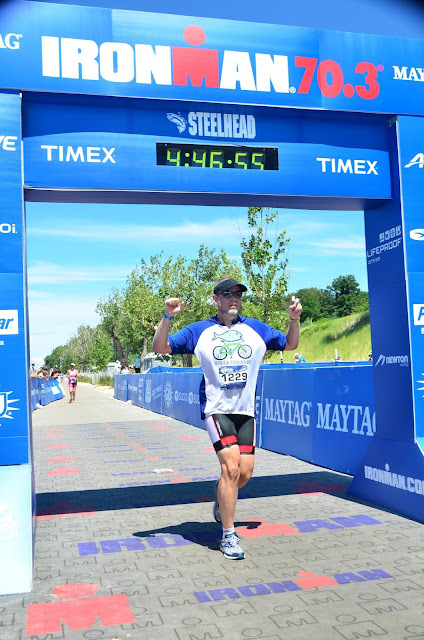 It's not quite as spectacular as cornering a turn at 20 mph, but I finished the bike leg only five minutes slower than last year and unlike last year I finished with enough energy to complete a half marathon immediately afterwards. I also had a slightly different perspective on those hills at the end thanks to Michigan Mountain Mayhem. One of the fun logistical challenges about an endurance event like this is that you have to really plan out what, how, and when you eat. A good portion of training is actually spent in learning what your gut can handle under race-like conditions. On the bike I started out eating peanut butter sandwiches and peanut M&Ms (no joke), then moved to gels and Gatorade toward the end. I brought the sandwiches and M&Ms with me and one expendable hydration bottle. But for the rest I picked up along the way at aid stations. For me, getting off the bike and starting to run is always an awkward experience for the first few moments. This time, because the transition zone is so long, it wasn't all that awkward. I slapped on a bit more sunscreen, changed shoes, and put on my running hat and took off. The first three miles were tough mentally more than physically. It was hard not to be overwhelmed with the idea of having been out for over 4 hours already and just starting a half marathon run. I tried to focus on reading my body and trying to settle into a good pace and rhythm. I wasn't carrying any hydration or nutrition with me and was relying on the aid stations completely, since I knew they stocked everything I was familiar with and needed. I settled into a pattern where I would walk each aid station while I pick up a water, then either a gel or a Gatorade, then another water for one good sip then splash the rest on my head and take off. The aid stations were spaced out at around 2 miles apart, so the timing worked out pretty well. At around the 6th mile I got a second wind and went with it, but was careful not to over do it. The pace sped up until around mile 10, where I had my slowest mile. This is when the run got both physically and psychologically difficult. But somehow my brain was able to convince my body that I just had an easy 5k to do, and my body was gullible enough to go along with it. The run course had two laps, which made things easy for pacing and nutrition. But, as a location, view, and experience it wasn't exactly memorable or noteworthy. Most of it went through the Whirlpool headquarter's campus, so there was a good deal of running through parking lots and around the back sides of buildings near dumpsters and loading docks. Not exactly the same as if it were running along the shore of the lake on the boardwalks between sand dunes, for example. But, I wasn't here for sight seeing, I was here to get something done and I enjoyed the functional aspects of the run course, even if the form was lacking.